Singer, songwriter and poet Patti Smith was among the laureates of the American Eagle Awards organized by the National Music Council of the US. In her acceptance speech she read the IMC Five Music Rights because "it is nice to hear them orally so they stay within our mind". Paris, 16 juin 2017. - La 37ème Assemblée générale du Conseil international de la musique s’est tenue à Paphos (Chypre), les 11 et 12 juin 2017, dans le cadre du 7ème Forum européen de la musique dont le thème était : « Musique et diplomatie culturelle : relier les continents, rapprocher les cultures ». La 7ème édition du Forum européen de la musique a réuni musiciens, réseaux, organisations, enseignants, professionnels émergents, et amateurs de musique à Paphos pour explorer comment les initiatives de la société civile agissent dans ce domaine, et comment la musique peut rassembler, devenir un instrument de paix et de cohésion sociale. Paris, 16 June 2017. - The 37th General Assembly of the International Music Council took place in Pafos (Cyprus), 11–12 June 2017, in the framework of the 7th European Forum on Music which looked at the theme “Music and Cultural Diplomacy: Linking Continents – Bridging Cultures”. Members of the International Music Council gathered in Pafos (Cyprus), from 11 to 12 June 2017, for the organisation's 37th General Assembly, elected Emily Achieng’ Akuno (Kenya) as new IMC President. The 5th edition of the Music Rights Awards took place in Pafos, Cyprus on June 10th 2017 in the framework of the 7th European Forum on Music. Master of ceremony were IMC president Paul Dujardin and IMC Five Music Rights Champion Ramy Essam. Silja Fischer, Secretary General of the International Music Council and Alfons Karabuda will discuss the new collaboration between the Polar Music Prize and IMC in the selection of future Laureates. Diversity, in all its forms, will be top of the list when broadening the reach of the Polar Music Prize. A flagship project of the International Music Council (IMC), the IRC was launched in 1954 and will be hosted this year for the first time in Italy, co-organized with the Conservatory Vincenzo Bellini in the framework of the celebrations of this institution’s 400th anniversary. Is there a gender problem in the music industry ? 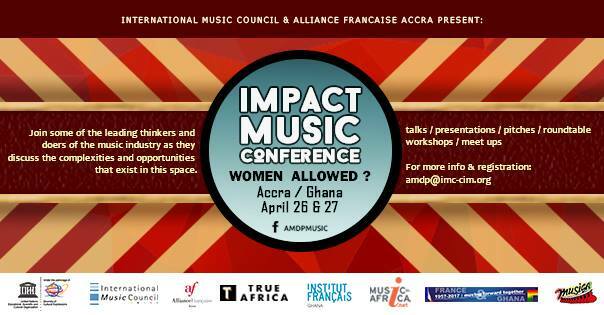 The International Music Council will bring together some of the leading names in the fields of music, marketing, policy and technology will meet at Alliance Française d'Accra for the 3rd Impact Music Conference. The aim of the conference is to develop a space to discuss, act, share, learn and understand that space called the Music Industry, and how to create equal opportunities for women in this sector. BOP Consulting are working with UNESCO to gather information and data for the 2017 edition of the UNESCO Global Report on the role of civil society in the promotion and implementation of the 2005 Convention.